Our Residents are encouraged to bring any small items of furniture, pictures or ornaments to make their room as familiar and homely as possible. Our team of house keeping staff takes great pride in their work, always making sure that the care home is fresh and clean for our Residents. Dedicated, 24-hour care is provided to all Residents to help maintain their choices, social independence and to live their lives to the fullest. We employ an Activities Co-ordinator to make sure that each Resident remains motivated and emotionally stimulated through an activities programme. Welcome to Gresley House Residential Home in Church Gresley, South Derbyshire. 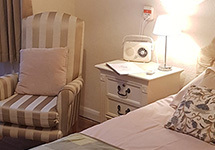 The care home has been fully refurbished and now offers single bedrooms, spacious lounges and an eight-passenger lift for residents residing on the upper floor. To the rear of the home is a very pleasant patio area, renovated to the highest of standards. This allows our Service Users to enjoy the garden and the outdoors, and to sit and walk around at their leisure. 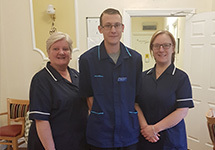 Accommodation is now available for 30 Residents in a warm and homely environment, where friendly, well trained and experienced care staff are on duty 24 hours a day. Our Service Users enjoy complete peace of mind, safe in the knowledge that our Care Assistants are always on hand to tend to their every need. We specialise in caring for people living with dementia. The small size of the care home allows us to provide the highest standards of professional care in a positive and relaxed atmosphere. Residents of both sexes and all religious denominations are welcome.